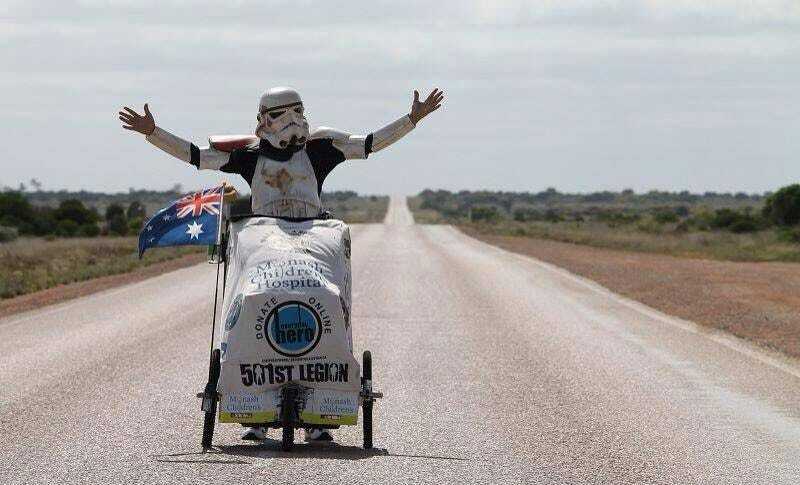 Scott Loxley, a member of the 501st Legion, is walking around Australia. It's a big country, I should know, but I also know that he's walking around the parts full of animals that kill humans for sport. In 18 months, Loxley has walked 5700 miles, which is just over halfway. In keeping with the Australian road theme, when hungry and alone in the desert, he will sometimes "grab snakes and cable tie them to his trolley alive until they are ready to eat." He's doing it all for charity, having raised nearly $20,000 in donations so far for a children's hospital. You can read more, and donate, here.